We begin today’s weekly roundup in the FT, where John Authers looked at the possible effect of the election on markets. John pointed out how the current calm in the markets belies the range of outcomes from the election, and their possible consequences. A Tory win would lead to a referendum on leaving the EU, and a Labour victory would see the most left wing government for forty years installed, propped up by a party dedicated to the destruction of the UK. A minority government of either colour, living from vote to vote, is quite possible. The first-past-the-post system, so recently validated in a two to one vote only four years ago, no longer seems fit for purpose. If neither of the big parties can win a clear majority, then surely everybody’s vote needs to count equally. At the moment it looks as though 4% of the electorate (SNP voters in Scotland) will have the biggest influence. And yet the markets are calm, with the FTSE 100 setting records. But that is a multinational index, and the UK-heavy FTSE 250 is 5% down over a year. 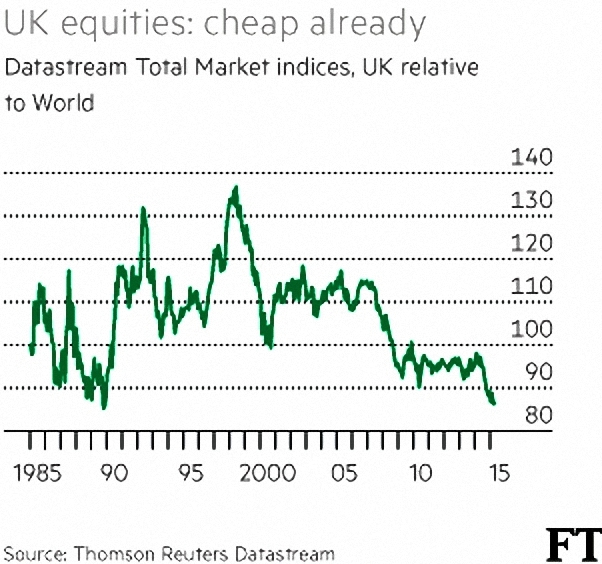 Relative to world markets, the UK is at its cheapest for 25 years. Sterling has also been strong, but recently it has underperformed relative to interest rate differences by around 6%. So the election buffers are there, if you know where to look. The Economist had more of the same. 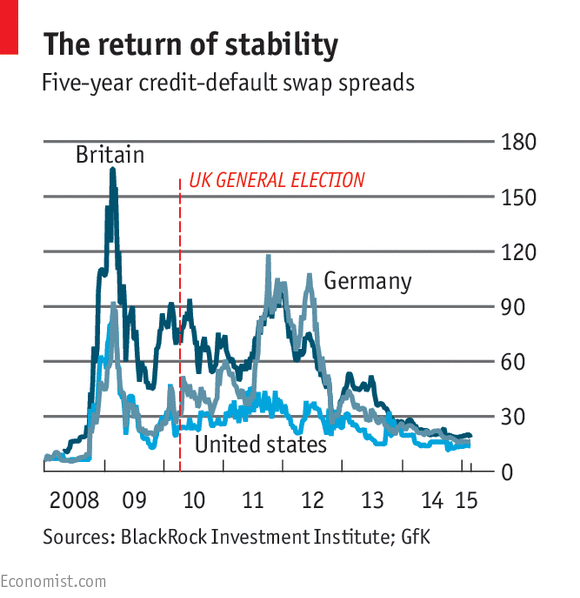 Credit default swap spreads are low – nobody is expecting a British default. Even Labour’s extra £30bn of borrowing each year (1.4% pf GDP) wouldn’t much impact the existing debt pile of £1.5trn (80% of GDP). 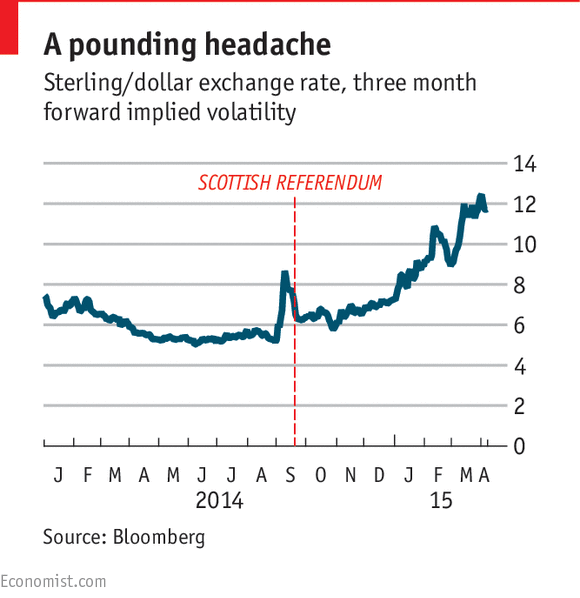 The implied volatility of Sterling is a different matter. It has been creeping up since the result of the Scottish referendum, and is now much higher than it was preceding that vote. So there are concerns that after the election, either an EU Brexit or Labour’s anti-business policies will make the UK less attractive to investors. Buttonwood looked at the takeover boom. Globally, deals are up 21% in 1Q15 vs 1Q14, the strongest first quarter since the 2009 crisis. Academic research into takeovers is not massively supportive1 but this rarely dissuades CEOs, who often seem to have personal agendas (such as the larger salaries a merged company can justify). Booms tend to happen when stock markets are doing well, and highly valued companies can finance deals with their shares. But in the current climate, low interest rates mean that even debt-financed deals – such as those by private equity firms – can look attractive. There’s also an element of musical chairs to a boom – once the music starts playing, CEOs start to look for somewhere to sit. If they can’t find somewhere, they run the risk of being the one who is sat on. 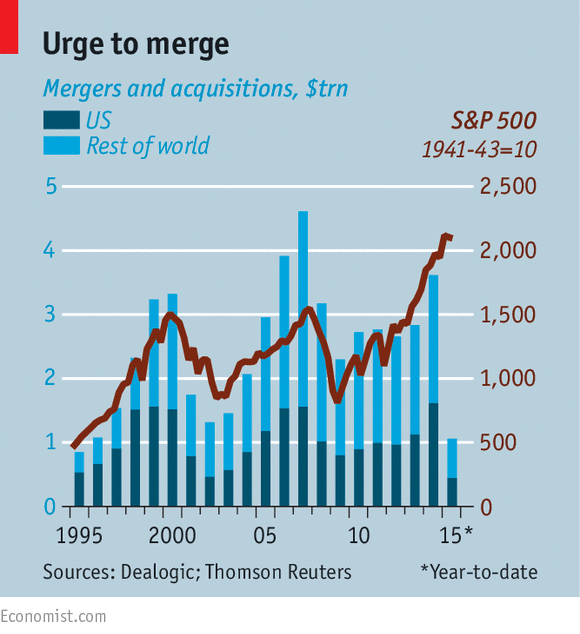 As yet, there is no sign of the cross-industry merger (think AOL / Time Warner) that marks the top of the market. Instead the deals are mostly within industry (Heinz / Kraft, Nokia /Alcatel, Shell / BG) where economies of scale are at least plausible. Even here, they usually indicate that organic earnings growth has become more difficult. More support for this comes from the high levels of share buy-backs, particularly in the US. This cycle can become vicious, with less investment and increasing need to cut costs. The end-point is usually a stock market crash. But first we need to get to a point where interest rates can be raised. 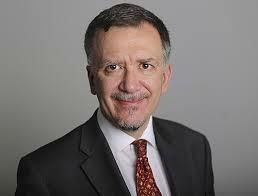 In the short-term, more takeovers should be expected. 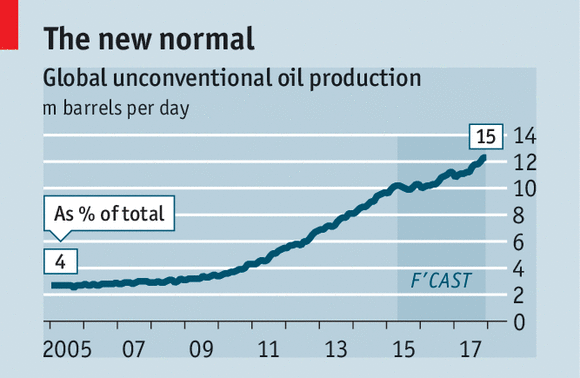 The oil price crash hasn’t knocked as many US shale frackers as might have been expected. After all, the Saudis did hint that was why they were keeping output high and prices low. Two thirds of 300 independent US producers had healthy balance sheets in 1Q15. Those in trouble had either bought unproductive plots, or expanded just before the price crash. Yields on “junk bonds” from these firms rose from 5% last summer to 10.5% in December, but are now back to 8%, where they were in 2012. The number of rigs has halved, but overall production is still growing. Frackers have been able to cut costs, as inputs like labour and steel have fallen in price. There have also been productivity gains as drilling techniques, fluid use and seismic data improve. Those firms that are in trouble may be bought out at bargain prices once reserves are re-valued in October. 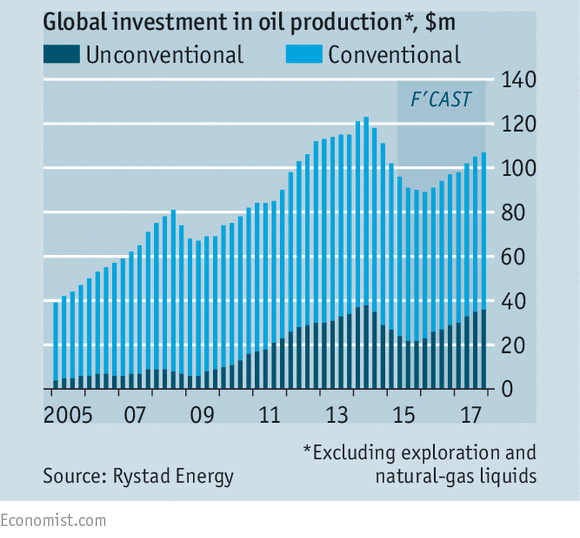 The resilience shown by US producers means that – political shocks aside – the oil price is unlikely to rise sharply anytime soon, despite firming demand. The Economist also reported on the fine wine investment market. A case of 1982 Lafite Rothschild which cost £300 at production (£1K in today’s money) is now worth £28K, and the global market is thought to be somewhere between $5bn and $10bn. Most of the good stuff is produced in very small quantities, due to legal and geographic constraints, and the weather means that no two years are alike. The globalisation of wealth has also increased the ranks of those seeking status symbols. Annual growth rates quotes by brokers are around 10%, but this masks a China-driven boom from 2008-11, and a subsequent bust. The 2008 Lafite is down 50% from its 2011 peak. The market is also largely unregulated and liquidity is poor (!). Transaction fees can be 20%. For the typical private investor, this makes the market uninvestible. Yet a reasonably low-cost index-tracker or ETF might prove popular, especially if diversified across other alternative assets like art, coins and cars. We have been thinking the same thing for thirty years, without any suitable vehicles appearing. Amongst others, LoveMoney covered the move by two P2P lenders into the pensions market. You need to open a separate RateSetter account – as well as the SIPP – and make new loan offers to take advantage. RateSetter operates like Zopa, with fixed term loans split across a large number of borrowers. There is no official compensation scheme, but RateSetter has its own provisions fund. RateSetter commented that 19% of their current lenders were of retirement age. EPM charge a £120 setup fee plus a minimum of £120 per year. L&C charge £540 for setup and £240 a year. There are entry qualifications (£100K income, or £200K in pensions, or £250K in liquid assets, or previous form as a business angel or company director). Assetz offer loans to businesses, or for property development or buy-to-let. Existing loans can be (laboriously) moved across to the SIPP at no charge. The EvolutionSIPP also allows access to equity crowdfunding sites (a much riskier prospect). Sippclub.com charge £1,750 a year (yes, you read that correctly) to operate the SIPP. So the good news is that P2P is slowly heading towards the tax wrappers where the interest rates on offer will finally make sense. But it’s SIPPs only for now, and the offers are inflexible and expensive. 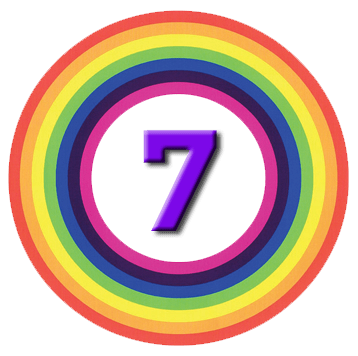 It’s ten years since I dipped my toe into P2P with Zopa, and I still can’t get the loans into my existing SIPPs and ISAs.